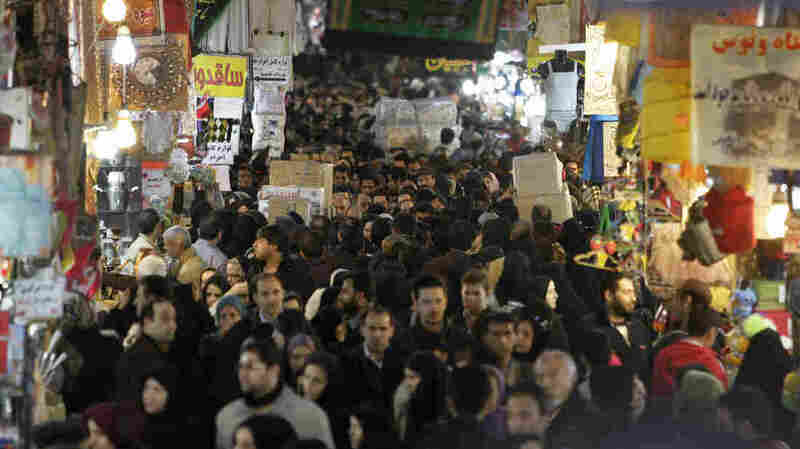 From All Sides, Iran Under Siege Iran is facing its most serious challenge since the war with Iraq in the 1980s. Abroad, the Syrian uprising is threatening to oust the Assad regime, Iran's sole Arab ally. At home, the EU oil embargo and U.S. banking sanctions are hurting the economy. And domestic criticism is growing. Iranians walk through the main bazaar in Tehran in January. Sanctions by the EU and U.S., plus political woes related to the Syrian uprising, have created the most serious crisis faced by Tehran since the 1980s. Iran appears to be facing a crisis more serious than anything it has experienced since its war with Iraq in the 1980s. Diplomatically, President Bashar Assad's regime is under threat from the widening war in Syria, Iran's sole ally in the Arab world. 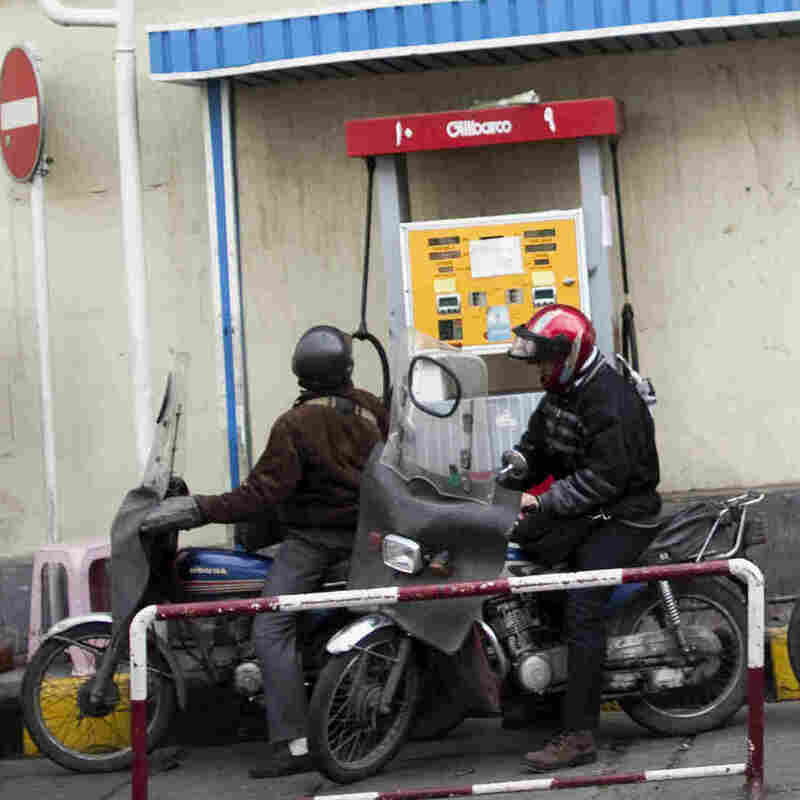 Domestically, the European oil embargo and U.S. banking sanctions are undermining the Iranian economy, bringing inflation, food shortages and unemployment. Iran is trying to maintain a defiant posture, without much success. It's an unprecedented set of problems facing Iran's leaders, says Abbas Milani, director of Iran studies at Stanford University. "By and large, I think they feel like they are in a very critical moment of diplomatic isolation and crisis," he says. 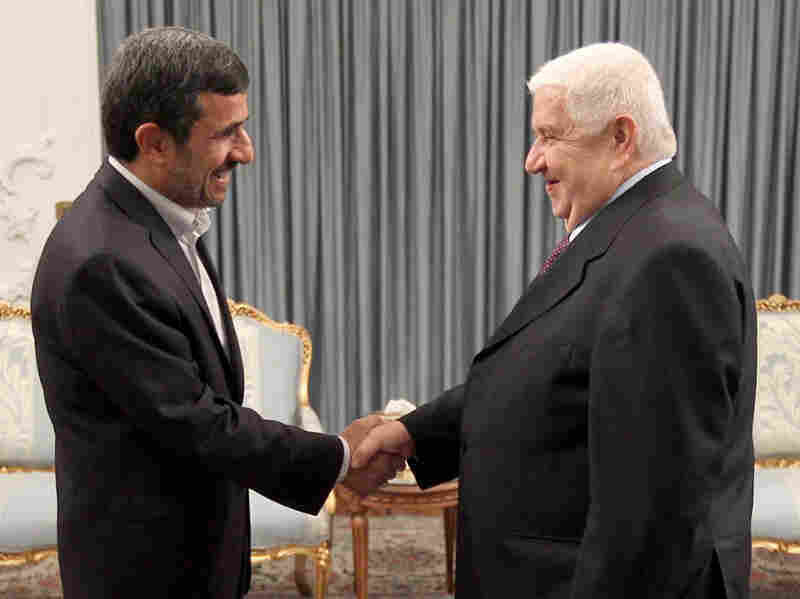 Iranian President Mahmoud Ahmadinejad (left) greets Syrian Foreign Minister Walid al-Muallem in the presidential palace in Tehran on July 29, in this official handout photo. The war in Syria threatens Iran's only ally in the Arab world. Paramount among the foreign policy challenges for Iran is the war in Syria, notes Alex Vatanka, an Iran analyst with the Middle East Institute in Washington. "The loss of Syria on the geopolitical map would be a huge blow to Iran," he says. Vatanka says Iran's recent claims about its power and influence in the Middle East — how Iran has hailed the uprisings across the Arab world — have been turned upside down by events from Syria to Egypt. "From being in a position where you hopefully are going to make inroads into the Arab world, through Cairo and perhaps elsewhere, you're finding the opposite is happening," Vatanka says. "You're actually losing ground in the Arab world in the shape of losing Syria." The war in Syria threatens to sever Iran's connection to Hezbollah in Lebanon. Without Syria as a middleman, it would be more difficult for Iran to move weapons and missiles to Hezbollah. And that undermines Iran's threats to and defense against Israel. To contain the damage, Iran has launched a multipronged diplomatic campaign. Last week, senior Iranian officials made visits to Syria, Turkey, Iraq and Lebanon. Then, Iranian Foreign Minister Ali Akhbar Salehi invited some 30 nations to gather in Tehran to talk over a peace initiative for Syria. Afterward Salehi claimed that Iran could be the peacemaker. "We have announced our readiness to host a meeting between the opposition and the government of Syria, to facilitate for such meeting," he said. "We have contacted the Syrian government. Yes, we have been in contact with the opposition." But it's not clear who speaks for Iran's government. Salehi has been the voice of moderation. But others, such as some top commanders of the Revolutionary Guards, have been more bellicose, threatening Turkey and hailing what they are calling the axis of resistance: Iran, Syria and Hezbollah. Iran is also facing challenges from elsewhere in the Middle East, notably Saudi Arabia, says Muhammad Sahimi of the University of Southern California. "A big part of what they see that is happening in Syria, the Iranian government sees it as instigated by Saudi Arabia. And they see Saudi Arabia as basically a puppet of the United States," he says. It is not lost on Iran's leaders that Saudi Arabia is supplying funds and weapons to the Syrian opposition. As Syria weakens, Saudi Arabia's influence is growing, an even greater challenge to Iran. And there's another dimension to Iran's problems, says Stanford's Abbas Milani. "Remember all of this is taking place in the context of a very, very serious economic crisis," he says. 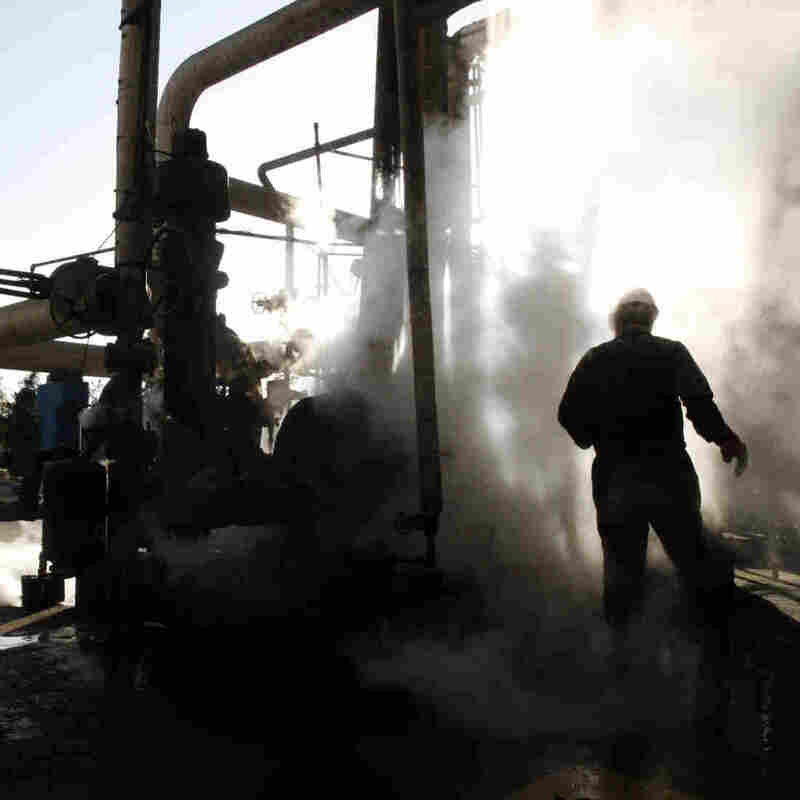 A European boycott of Iranian oil went into effect on July 1, as did sharp U.S. banking sanctions. Right now, Iran's export of oil is roughly half what it was a year ago, and by some estimates that is costing Iran more than $130 million a day. The Iranians counted on the oil embargo prompting a jump in oil prices, says Sahimi, who also writes for the website Tehran Bureau. But that didn't happen. 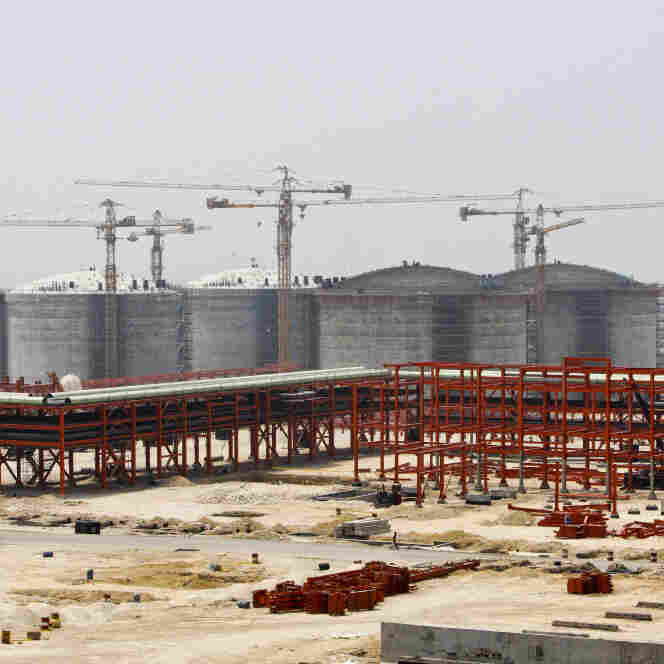 "Altogether I would say that the oil sanction has been very successful. In fact that has surprised the Iranian government," he says. That has brought inflation and unemployment; even some food riots have been reported. The effects of the sanctions have been too apparent to deny, says Vatanka of the Middle East Institute. "There's no doubt, based on all the figures and even statements coming from Tehran, that they are suffering," he says. "We only have to take the words of the leadership in Tehran. They are saying they are hurting." And this has led to unprecedented criticism of Supreme Leader Ali Khamenei's foreign and domestic policies — in the press, in Parliament, from a wide spectrum of conservative voices. At the same time, the U.S. and Europe have allowed the ongoing negotiations over Iran's nuclear activities to slow to a crawl. That benefits the U.S. and Europe, in the view of Milani. "Their strategy is to allow these sanctions to continue. They think they are biting and I think they are right," he says. "And they think the bite will increase, and again I think they are right." Increasingly, Iranians see the link between their nation's nuclear ambitions and the pain of the oil embargo and banking sanctions. Add to that the trouble on the diplomatic front — and a series of effective cyberattacks — and it's fair to say Iran is facing unprecedented challenges it did not expect just a few months ago.